Banana Bungalow Hollywood i Los Angeles, USA : Boka nu! The straff was really really helpful with everything, and arranged a lot of fun activities! A really great place to meet a LOT of different people! It was awesome, I had the time of my life. They made so much different things everyday that we could join and drove us around in the city! Cant complain and met some nice friends there! 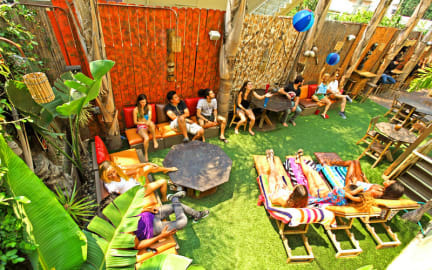 Best hostel in hollywood that I've stayed at! Clean rooms, great staff and the common room was perfect for meeting new people! Traveled alone and couldn't be happier! Second time I’m staying at this place, great stay this time as well. Easy parking, check in, fun events, ok breakfast and overall a good experience.